PITTSBURGH | There isn’t a lot of finesse in Patric Hornqvist’s game. The Pittsburgh Penguins forward understands his job is to get to the places on the ice that not everyone wants to go, set up camp there and make something happen. Hornqvist’s record-setting run began in typical Hornqvist fashion. 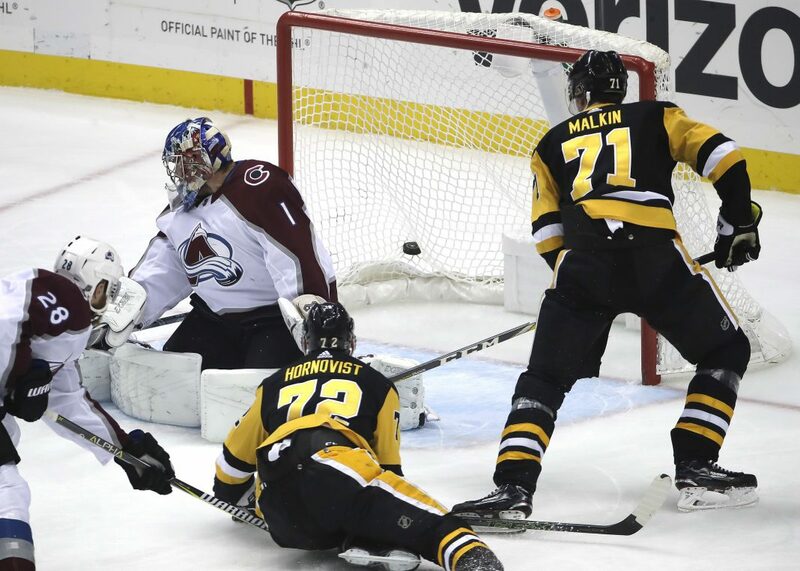 The 31-year-old Swede parked himself in front of Varlamov, corralled a rebound off a Kris Letang shot, jabbed at the puck once before spinning around and whipping it by the goaltender 6:11 in the third to put Pittsburgh back in front. He needed just 1:21 to double the Penguins’ advantage and completed the hat trick on his next shift when he fired a wrist shot from the slot that appeared to hit off Colorado’s Alexander Kerfoot and sneak past Varlamov. Varlamov made 26 stops, but struggled early and late as Colorado’s six-game road winning streak came to an abrupt halt. “To be honest, erase seven and a half minutes out of that game and I liked what I saw on both sides of the puck,” Avalanche coach Jared Bednar said. Barrie’s power-play shot from the point 8:16 into the period gave Colorado a spark. Ian Cole, playing in Pittsburgh for the first time since helping the Penguins win consecutive Stanley Cups in 2016 and 2017, fired a knuckler toward the net that Soderberg managed to get a stick on and deflect past DeSmith. Nieto found a gap with the Penguins on the power play to slip the puck by DeSmith to tie the game, the seventh short-handed goal allowed by Pittsburgh this season. Hornqvist’s historic stretch, however, helped the Penguins avoid a collapse while cooling off the Avalanche, at least for a night. NOTES: Pittsburgh D Marcus Pettersson, acquired in a trade with Anaheim on Monday, played 13:00. … Both teams went 1 for 3 on the power play. … Pittsburgh is 8-1-1 against the Western Conference.